Yes, the ribs twist a little, and some of them are less straight than others, but otherwise...it fooled me into thinking everything was just as OK inside as outside. 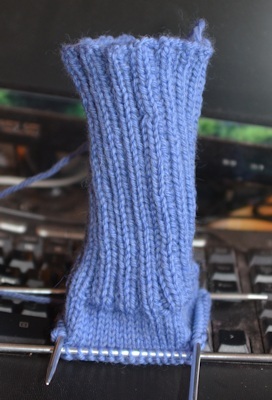 I found it when I put my foot through the part-sock to check whether I wanted to add an inch to the ribbing beyond its usual length (no, was the answer to that. Five inches is still my favorite length) and caught a toe in the loop. When I turned the top down, it was really obvious that had happened...a needle's worth of knitting skipped with the yarn "carried along" inside. I'm still pondering how exactly to fix it, given my skills and the problem. It could be solved by ripping out all the knitting back to that row, to where I didn't knit sixteen stitches, but that's a lot of ripping out, and yarn can react badly to that much undoing and then redoing. Certainly I'd have yards and yards--about 40 yards, at a guess--of yarn to treat so that it would knit smoothly again (dampen it, wind it with just enough tension to straighten the kinks around something like a paper towel or toilet paper roll). Or...I can cut it, attach a longer length of yarn to each end, and weave the ends in and secure them. (It's not long enough to weave in both ends as it is.) That's going to be a bit tricky, too, because the yarn's under a little tension now and will tend to creep back through the stitch it was connected to. But I prefer that to frogging/ripping back so many rows with yarn that I know fuzzes up when ripped, however carefully. It's frustrating because I have had the problem before and caught it sooner, and I do try to be sure the yarn runs directly from the ball to the point where I'm knitting, with no detours...but I didn't try hard enough this time. It's also frustrating because I did notice the little "jink" in the rib that is connected to the strand behind, about two rows beyond it, but I did not investigate the cause--I thought it was just an inadvertent change in tension. Advice to others--don't make this mistake; it's a pain to fix. Background advice: haste makes waste. I wanted to finish this pair by the end of the year, so I was knitting as fast as I can (which isn't that fast) AND knitting distracted (TV) which is asking for trouble. On the bright side...I managed to do my very first bit of "stranded knitting" (albeit not stranded colorwork) with amazing ease. Oh, what a pain! I've had that happen to me before, but I noticed it not long after. If it's mostly wool yarn I'd cut it in the middle and do a spit-splice with new yarn and weave in the ends. I'd probably do a duplicate weave in down the leg of the rib so it doesn't creep. I think that's probably the easiest solution. It's such a lovely colour, makes me think of bluebells! It really is a pretty color. I'm not sure the photo shows it accurately (it was flash, fairly close) but it's just one of those blues that makes you feel happy when you're working with it or it's on your feet. Thanks for advice--that's kind of what I was thinking, and it helps that someone's got the same idea. Don't float away with all the rain. It is also raining up here in NH - NO SNOW yet. I wish I'd thought of "Secret Life of Socks" for the post subject line! Brilliant. We won't get *that* much rain (so far under an inch) though the ground is still not dry after the previous ones. It's the first time in the 37 years we've lived here that the ground didn't firm up all over after a week w/o rain. That's how much water the October through early December rains put in the ground. I tried, but was distracted from the music looking for any sign of knitting other than the ball of yarn shown first. Crochet...embroidery...needlepoint...but not knitting. And certainly not seed stitch. If you're going to sing about "knit and purl" and call the song seed stitch, and if you want knitters to listen to it, the visual should include knitting seed stitch. In my opinion. Or because I'm easily distracted into looking for things mentioned in a song. Ah, such technical details are beyond me - my only foray into knitting was in my teens, when I took my mother's odd bits of yarn and turned them into a Dr Who (Tom Baker era) scarf. There's a heckuva lot of work in a Dr. Who scarf. Well, it's fixed now. I couldn't find the small clips I would've used on the ends to hold them after I cut the strand in two, so I used wooden clothespins. As usual, my attempt to make the yarn bond with spit-welding didn't work so it was time to attempt a stable knot with a strand barely an inch long and a strand about 10 inches long. Not easy, because of the short end, but I got it done, on both sides, and then wove in the long end as far down as I could turn the cuff with the needles impeding me at the bottom. The joins may not last as long as a straight run of yarn would, but at least I could go on with the sock, which now has its full heel flap, the heel turned, and the stitches along the sides of the heel flap picked up with the next smaller size needle, ready to start knitting the gusset decreases. I went to see STAR WARS instead today. The curse of socks is upon me, cried the lady of...well...whatever. 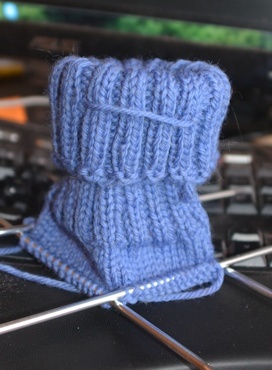 The left gusset of the sock I'm working on decided to deconstruct at the join to the upper sock. I have tried fixes that worked before, and it's determined to go wrong. Tinking back the joining is...tricky at best. This is not being "at best." The word ARGH!!!! keeps coming out of my mouth, while others are running through my mind. Occasionally escaping. I live in Oregon and appreciated your essay. But please do correct the spelling from Malneur to Malheur. Yes. I know--I even knew that but mis-typed it. I do that when tired, rushed, or angry. And my vision for reading my posts on the computer is deteriorating (the two eyes don't focus on the same plane, so I usually close one and squint. Doesn't work perfectly. OK with distance vision, but close vision has become....tricky.) Just got back from a trip and am reading LJ comments.